I am one of those unfortunate people who cannot get away with just blow drying my hair or leaving it to dry naturally. Without styling my hair, after drying it is insanely fluffy; a little frizzy, but I am reluctant to describe my hair as frizzy as to me the word makes me think of course hair that is not silky. I have soft hair, it's just messy without being styled. I received the John Frieda Frizz Ease 3 Day Straight in a Cosmopolitan goody bag. It is not something I would normally buy for myself but as I had been given it I thought I would give it a whirl! 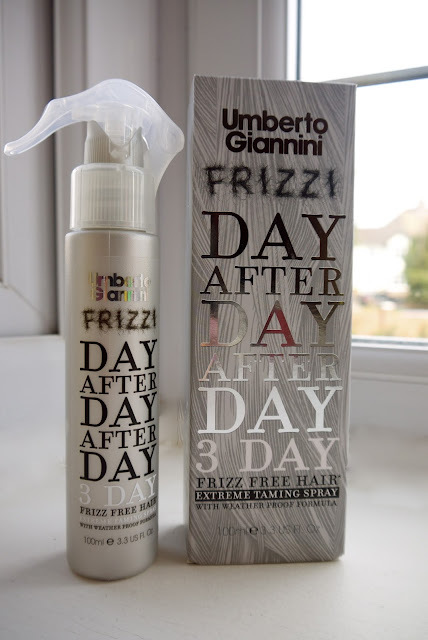 The product claims to maintain hair frizz for 3 days (as you may have guessed from the name!). You're supposed to use it on damp hair, blow dry it and then straighten. I've used this product a few times and have been disappointed every time I have; at this point, I've pretty much given up on it. After I use it on my damp hair and then blow dry it, my hair becomes EXTREMELY knotted and doesn't feel as silky smooth as it normally does. Thank god for my tangle teezer, if I didn't have that my hair would probably be quite damaged from trying to brush out the knots with a normal hairbrush. Even after the ordeal of brushing out the knots, my hair still needed smoothing with serum or oil. I couldn't go three days without washing my hair, so the concept of this product is not something that interests me anyway. I assume (hope!) that it would work better for people with course/dry hair that can normally last three days without washing it. But for me, unfortunately, this product was a complete no go!